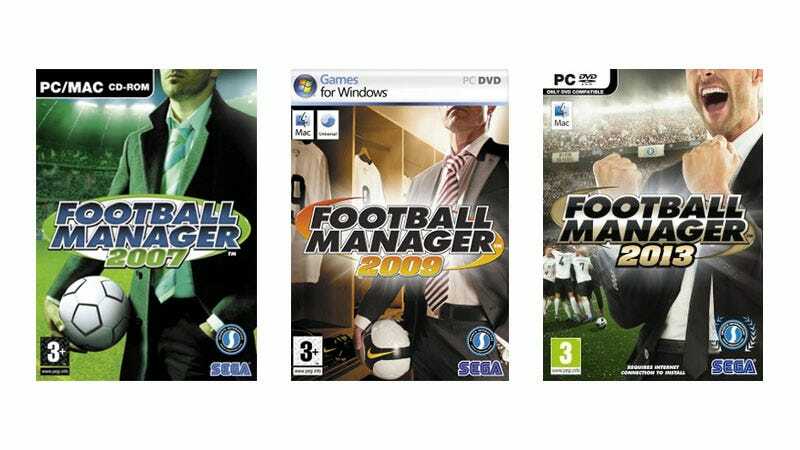 While other sports games change their cover athletes every year, strategy stalwart Football Manager has for over a decade stuck with the same basic template: show a man from the nose down, usually in a suit, usually with a scruffy beard, standing around looking like the boss. For this year’s Football Manager 2019, though, he’s gone. This brings to an end his 14-year tenure in front of one of the biggest-selling video game series on Earth. It of course isn’t literally the same model/man, but the concept—helped by the fact you never saw his entire face—led to him becoming something of a character, known simply as “Manager Man”. At least his departure has been handled with the appropriate gravitas. In a statement sent to Eurogamer, developers Sports Interactive say that with a new COO and new office in the last year, the team thought this was “the perfect opportunity for us to have a think about our branding”. They&apos;re so disappointed. They can&apos;t believe you did that. Why would you do that?